All these stories about Connacht having trouble at the RDS? Pah! They can only be classed as underdogs for this match in the sense that we have home advantage. Given the expectations that go with being the reigning Pro12 champions, not to mention the impeccable standards achieved by Pat Lam’s men en route to earning that title, in many ways this is Leinster’s biggest challenge of the domestic campaign so far, and an interpro derby to boot. 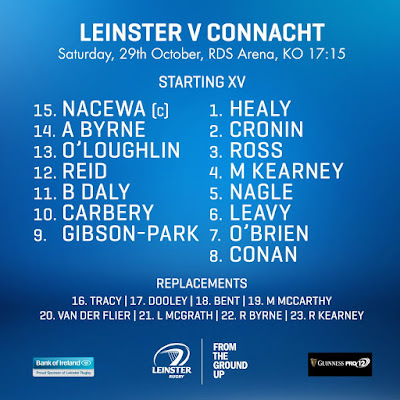 Of course it is important to note that the fixture falls a week before the November internationals, and it certainly doesn’t help Leinster’s cause that there are a host of players in the Connacht lineup who could well feel aggrieved not to have been named in the squad for said test series. But those are debates for another day...let’s see how this particular Leinster selection stacks up. It’s a very different backline to that which started in Montpellier but still there’s a sense of youthful energy about it, with Isa back at 15 to keep an eye on things. On evidence this season so far I’d put Gibson-Park ahead of Luke McGrath in our pecking order and this will be a good opportunity for him to cement that status. Outside him is Joey Carbery who must be positively glowing from his Ireland call-up. The centres are Noel Reid and Rory O’Loughlin, a pairing blessed with plenty of ability going forward but will also need to be especially vigilant on the defensive side of things against a Connacht side that will be poised to make the most out of every mis-step on our part. On the wing Adam Byrne and Barry Daly have found the tryline many times for both UCD and Leinster A and now is the time to start doing it at senior level. 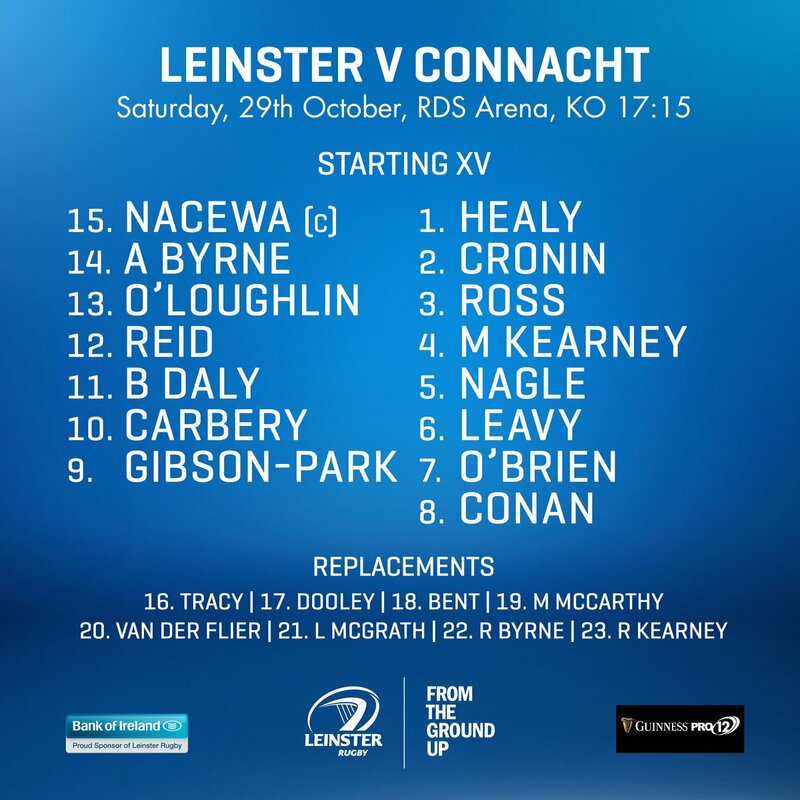 But looking at the lineups you have to think it’s in the pack where Leinster can have the winning of this match. Connacht come with a cracking back row trio but the same can be said for us and I’d say the odds on someone named Sean O’Brien to win man of the match would be very narrow, though it could be for either side. Still, I feel we might just have an edge on the visitors throughout the forwards all the way down to the bench...if we can continue our recent form particularly in set pieces I think we can get ahead in the early stages, though with a word of warning - this ref John Lacey isn’t a big fan of teams looking for penalties at the back of scrums so we’d probably be better off using the ball quickly. As I said earlier, we know all too well what this Connacht side can do to us if we give them even an inch. Their back three in particular is electric and we can expect them to test our defensive line at every opportunity, most likely by turning us hoping to force a mistake. For this reason I’m thinking this could be a relatively high-scoring affair. The bookies predict a home win by 7 points...I also think we’ll prevail but not by as much, say 4-6pts and we’ll probably need every bit of our bench to get the match points in the bag.